At their first meeting, Arthur Conan Doyle and his new brother-in-law, E. W. Hornung, retired from a heavy lunch to sit in Conan Doyle’s lounge and read the Sunday newspapers. Hornung and Conan Doyle met in 1886, at a time when the success of the Sherlock Holmes stories was so pronounced that a flood of fairly middling imitators had begun to crowd the nation's book-stalls, in order to take advantage of the new-found vogue for mystery fiction. By the early 1890s, a league of new detective characters were gracing the pages of novels and literary magazines, including: Dr. Thorndyke (the 'medical jurispractitioner' - or forensic scientist - from the novels by R. Austin Freeman), Loveday Brooke (the first female detective from Ludgate Magazine), Thomas Carnacki (the psychic detective, from The Idler) and Max Carrados (the blind detective, from The Strand). However, it was Hornung that enjoyed most success with his own literary rival to Sherlock Holmes, simply by inverting the formula that enjoyed so much success in his brother-in-law’s work. His adventures were detailed by his friend, Bunny Manders, a struggling journalist who had first met the young Raffles whilst fagging for him in school. The first of Raffles’ adventures, The Ides of March, appeared in the June 1898 edition of Cassell's Magazine, and, whilst Hornung's character was never destined to eclipse the success of Sherlock Holmes, he was considerably closer on his heels than most. "I think I may claim that his famous character Raffles was a kind of inversion of Sherlock Holmes, Bunny playing Watson. He admits as much in his kindly dedication. I think there are few finer examples of short-story writing in our language than these, though I confess I think they are rather dangerous in their suggestion. I told him so before he put pen to paper, and the result has, I fear, borne me out. You must not make the criminal a hero." Much to Conan Doyle’s consternation, Hornung ignored his advice and went on to publish three volumes of Raffles short stories - The Amateur Cracksman (1898), The Black Mask (1901), and A Thief in the Night (1905); and one novel, Mr. Justice Raffles (1909). 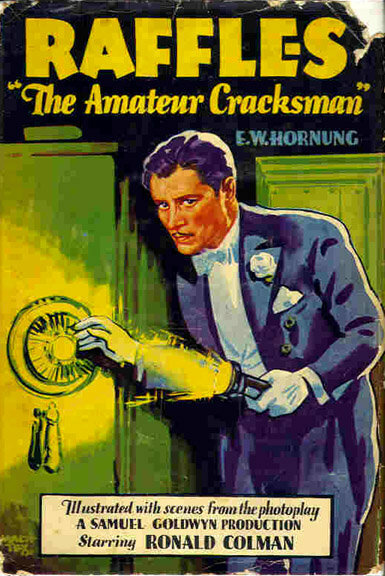 To make matters worse, a dramatic version of Raffles, the Amateur Cracksman played for two years on the London stage, with Sir Gerald du Maurier in the lead role. Several film and TV adaptions have since been made, in which the eponymous hero has been played by such notable acting smoothies as John Barrymore, Ronald Colman, David Niven and (this century) Nigel Havers. In every way, A. J. Raffles is the polar opposite of Sherlock Holmes. In place of Holmes’ brooding intensity, Raffles exudes a cool and easy charm. Where Holmes fights crime, Raffles plans it. When wallowing in depressed boredom, Doyle’s man uses cocaine to relieve his symptoms - Hornung’s slips off for a game of cricket. Ever practical, Sherlock lives in rather down-at-heel digs at 221b Baker Street, whereas A.J. lives (much beyond his means) in a luxury residence in the fashionable St. James' district of west London. But whilst an army of Sherlock Holmes fans may delight that, in terms of legacy, Hornung’s imitation never surpassed Conan Doyle’s original, the rivalry between the two writers actually seems to have been a fairly playful one. Indeed, The Adventure of Charles Augustus Milverton (1904) is Conan Doyle’s homage to his brother-in-law’s creation. In the story, Holmes and Watson burgle the house of a master blackmailer. What makes it unusual as a Sherlock Holmes narrative is that there is no mystery to unravel. The action - much closer to a Raffles adventure – centres on the audacious way in which Holmes and Watson break into the guarded house. However, whilst Holmes and Watson are essentially functioning outside the law, Conan Doyle makes it very clear that his characters are helping a wronged woman - not acting in their own interests. The appeal of Hornung’s writing is far more than just his association with Conan Doyle's literary creation, however. Raffles endures because of the quality of his creator’s story-telling. George Orwell, in his 1944 essay Raffles and Miss Blandish, applauds Hornung for creating a gentleman cricketer as a middle-class thief, commenting that "a cruder writer would have made the ‘gentleman burglar’ a member of the peerage, or at least a baronet. "Hornung was a very conscientious and able writer," concludes Orwell. "Anybody who cares for sheer efficiency must admire his work". 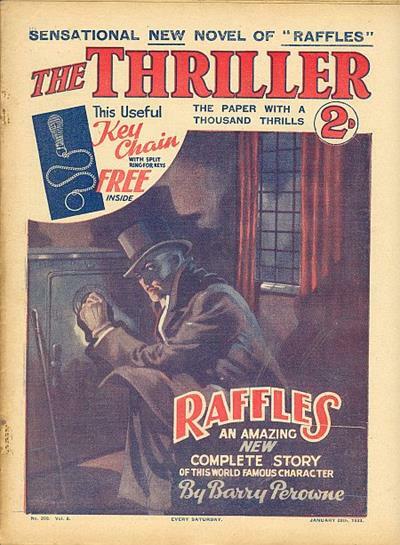 Read E. W. Hornung's Raffles stories here. Hornung was a lovely, poetic writer. It is a shame that he is not better known nowadays. I have always thought him to be a much better writer than Arthur Conan Doyle - he always got to the point much more quickly in his short stories. He was married to Conan Doyle's sister Constance and they had one son who was named Arthur after his uncle. Tragically his son was killed in WW1. After a long search Hornung located his son's grave and a moving account of this discovery is described in Hornung's 'Notes of a Camp Follower on the Western Front'. I loved the T.V series Anthony Valentines portrayal as "Raffles"was excellent I have the box set and watch it from time to time.